The Reloading Press is an at-least-weekly feature here on Gaming Ballistic for 2016. Each week it looks at some interesting real-world cartridges and presents them with hopefully-useful information in GURPS Format. 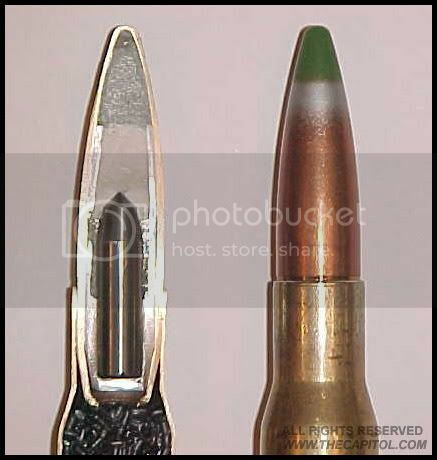 The .50 BMG is an iconic cartridge. It virtually defines “large bore rifle” in the modern world – or at least the Western world – which isn’t bad for a cartridge designed in 1918 or so based on a scaled-up .30-06. It’s available in a bewildering array of chamberings, and is one of the standard military-grade projectiles that’s actually useful and feasible to start to do cool things with, like have saboted or explosive projectiles. This cartridge has been fired out of everything from pistols to rifles to machineguns to gatling guns, from the ground, sea, and air. If there’s been a fight in the last 100 years that involves a military force, odds are someone cracked one of these off somewhere. Basic inputs for the calculator are as follows, selecting 1100mm for the barrel length, which is basically the barrel length of the standard M2HB machinegun. The entire platform was designed around the 810mm barrel of the M99 single-shot platform. The velocity is at the muzzle. The velocity with a 1100mm (about 45″) test barrel is tuned to match real-world data at 3,150fps with a 395gr turned-brass bullet. 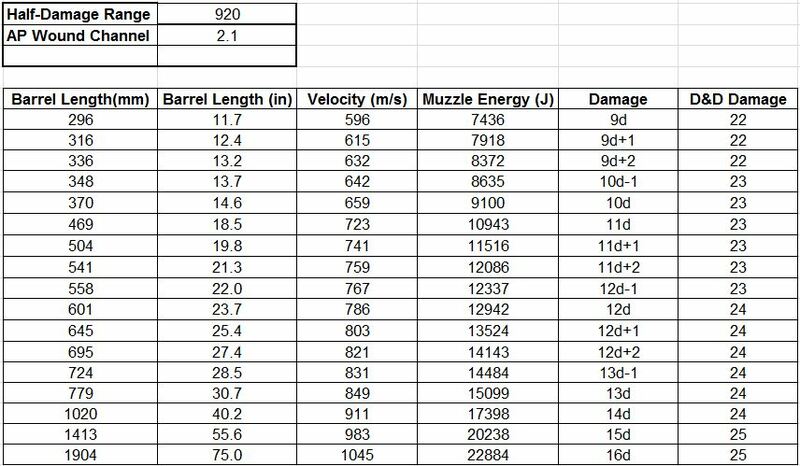 With damage as high as it is, I didn’t do the point-by-point barrel lengths, in most places, but at the pistol level and the barrel lengths that usually distinguish portable rifles (18-28″), I broke it down a bit. An unusual word about DnD damage – the nice thing here is that from 24″ to 45″, the damage is the same, at about 2d12, which is the value listed in d20 Modern (3.5edition based). Well, of course someone went and made a pistol out of something originally designed to fire out of a barrel nearly four feet long using a linked feed, so the chart goes all the way down to about a foot worth of barrel. Which is, it might be noted, only 3x the length of the cartridge. There are a lot of different loads here. The most energetic solid projectile on Wiki is an 800gr bullet at about 2,900fps, which will do 15d instead of 14d from an 1.1m barrel . . . but which 1/2D range increases to something like 1,250yds, with a max that extends to 7,770yds, largely due to the aspect ratio of the projectile. Armor piercing versions of the basic round exist, which use a hardened steel core instead of a mild steel one. Based on the limited information I could find, this is roughly a 20-25% boost in penetration over the basic ball round, which is more like +1 per die than the usual (2). A projectile so egregiously overpowered that every gamer will want more, the M903 (and its tracer cousin) fire 360-gr tungsten projectiles of roughly .30 caliber and 5:1 aspect ratio out of a saboted projectile. These things leave the barrel at about 4,000fps, and will penetrate over DR 90 at 500m. Earning its (2) armor divisor, that suggests about 45 points of penetration at 500m, or about 12d+2. My calculator gives about 16d at the muzzle, and . 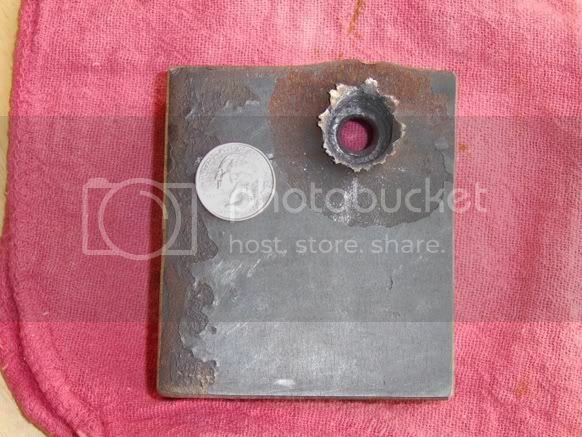 . . 45.3 points of damage at 550yds/500m. So booyah, and this is why I use this thing. Finally, the “I’ll have my cake and eat it too” projectile, the Mk211 Mod 0 fires a 671gr projectile at 886m/s for 14d-1 damage, but it also packs a tungsten core and 13 grains of Composition A explosive and another 13 grains of incendiary compound. That’s less than a gram of each, and almost certainly is to enhance fragmentation effects. Clearly the designers of this projectile did not get their coffee that morning, cause they were feeling nasty. With so little explosive, I’d just treat it as a x3 modifier against living critters due to internal explosions, and also give it the ability to set fires for flammable objects. This web page at survivalmonkey.com represents the best consolidation of information I’ve ever found on the .50BMG. The .50 BMG is a very popular cartridge, especially in the hands of military operators that don’t have to tap-dance to justify owning one. However, the price of entry for such a beast is quite steep, and the lowest I could find for a single-shot, bolt-action rifle clocked in at $2,000 . . . and that’s just the rifle. If you want to shoot at a mile or two, you’ll need a high-quality optic that will probably run you just about as much – a popular model seems to be Schmidt and Bender, and one of those can run you $2,500-3,000. And there are always ways to pay more. That being said, with the right ammo and the right scope and the right shooter, you can deliver a 2.6″ 5-shot group at 1,000 yds (that was the world-record at the time), which in GURPS is about Acc 7.5. The Safety Harbor Firearms company can get you into a .50BMG for the lowest price out there that I could find, at under $2,000 for a single-shot bolt-action rifle with a 29″ barrel. Spend a tetch more and you can feed from a 5-round box. Armalite AR-50 is on the “low” end of price for single-shot, bolt action rifles. It clocks in at 34 lbs (! ), is nearly five feet long, with a 30″ barrel. Bushmaster’s BA50 is a bolt-action rifle with a 10-round box magazine. It runs $5,600 and weighs 30 lbs as well. It disassembles like an AR15, so familiarity is there for many shooters. Desert Tech makes a pretty sweet bullpup style rifle for the low-low price of around $7,600, which only weighs 20 lbs, sports a 5-round box magazine and a 29″ barrel. They have a cool on-line configurator as well, which is a good way to waste some time. 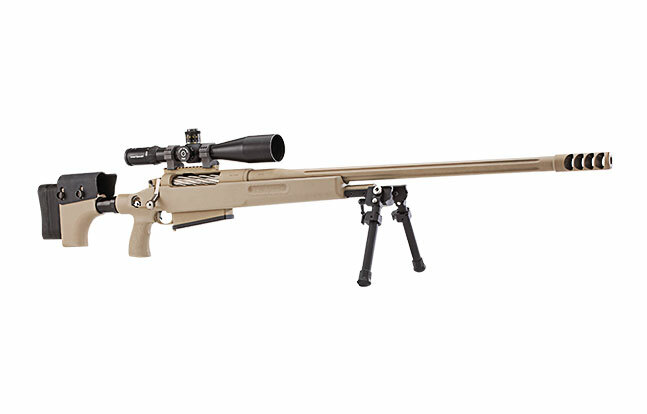 If you’ve got $12,000 to spare, check out the McMillan TAC 50 A1-R2. 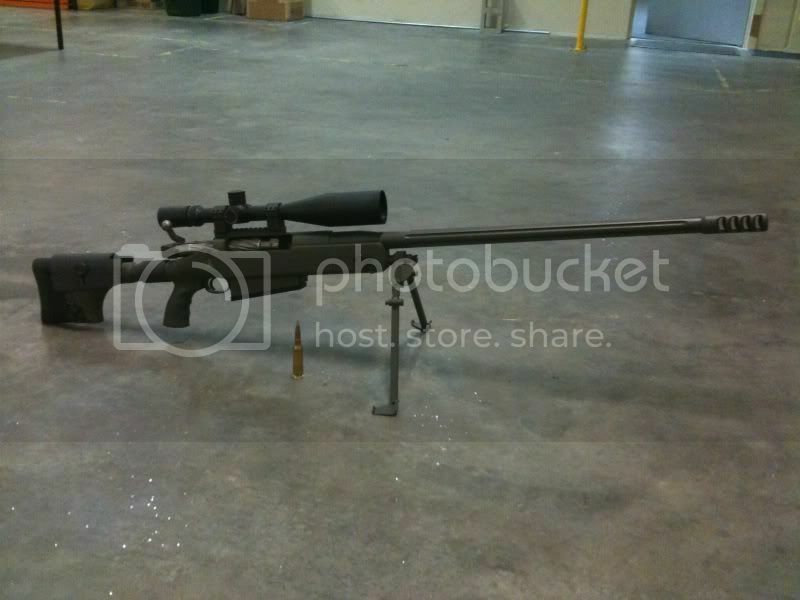 26 lbs, 29″ barrel, and bolt action with a 5-round magazine. And finally, you can’t talk about .50BMG without talking about Barrett Firearms. They basically have come to define the genre in many minds, and certainly the minds of Hollywood, where nothing quite says .50BMG like a Barrett, and they were even modded up to be railguns in a forgettable Arnie flick. They come in bolt action (M99), bolt-action bullpup (M95), and conventional layout semi-automatic (M82 and M107). There was an XM500 semi-auto bullpup at least in development for a bit, but not sure what happened to that one. "still deliver 6d pi++ or 7dpi++ a kilometer away"
Aren't those pi+ for the ball round? You're right by RAW, of course, as the breakpoint is 15mm, and I'll make that change. The trick, of course, is that the 275gr .50 GI (275gr at 1000fps) gets the same size modifier as the .50BMG (650gr at 2,900fps) at pi+. My program uses a momentum and cross-section-based formula to come up with the wound channel modifiers, and the .50BMG is so big, and so fast, that it clocks in at the 2.0 WCM where the .45ACP and .50GI both are likely in the 1.5 to 1.7 range. Another fantastic contribution to Reloading Press! I'll definitely be making use of this information at some point (in theory or practice) for my campaign material. For those out there wondering "What about the Desert Eagle?!" it is chambered in .50 AE, not BMG. Pre-Orders are Now Open on Backerkit! Have I been playing my paladin wrong?